We frequently get calls from people having problems trying to connect computers to the Internet with wireless technology in their home. While laptops have built-in wireless antennas, desktop/tower computers require the installation of an internal PCI card for a wireless connection, or a USB connected antenna. Not only does this require installation of a card, but also software and wireless security configuration is necessary. When a PC is in a basement or second floor and far from the antenna, even a wireless card may not get a strong enough signal to yield a fast Internet connection. Also, some non-PC devices like the Microsoft XBox lack a wireless connection and are designed to use an Ethernet connection instead. For all of these situations, the better solution is using a Netgear PowerLine kit. These kits allow any computer with an Ethernet jack to connect to the Internet connection using the electrical outlet (power line) in your home or office. Each kit consists of two boxes; one for the computer and one for the router. 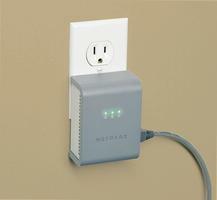 Each box plugs into the power outlet and provides either one or four Ethernet connections. The PowerLine kits communicate with each other over the electrical wiring in the house, providing a fast 85mbps or 200mbps connection. Available in 85mbps or faster 200mbps versions for improved performance. Zero software configuration needed; simply plug and connect. Solve the wireless distance problem in large houses or basements. Available in 1-port and 4-port models. Perfect for older homes with plaster and lathe walls that block wireless signals. Easily relocated; simply unplug to move it, no software changes needed. Works with any device that has an Ethernet connection, including laptops, desktops, towers, Xbox, etc. Contact us to for current pricing and ordering a Netgear PowerLine kit. This entry was posted in Computers and tagged Internet, Powerline, weak signal, wireless, xbox. Bookmark the permalink.